So, my mom used to make this recipe when I was a teenager and I loved to eat it, but wanted nothing to do with making it. Sounds familiar doesn’t it? I was about 14 when I remember my mom making this dish, but I hadn’t really been interested in cooking at that point in my life. Little did I know I would come to love cooking. 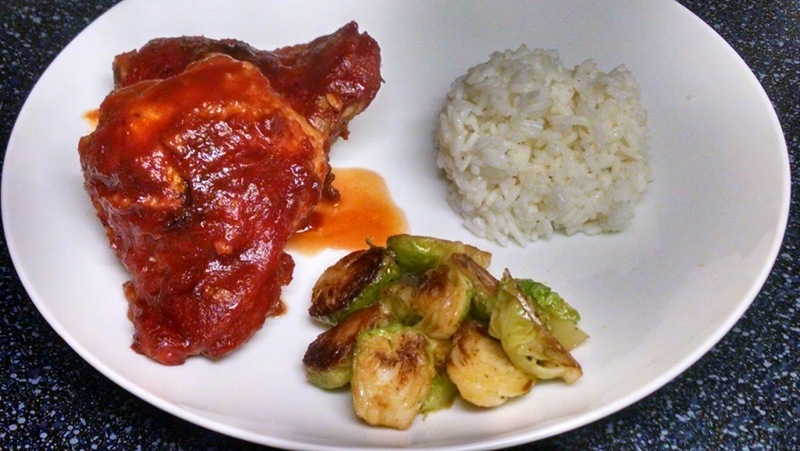 The recipe is a play on barbecued chicken with a sauce that was very tomato and vinegar forward, but it is balanced with some sweetness and a little garlic to really bring it together. 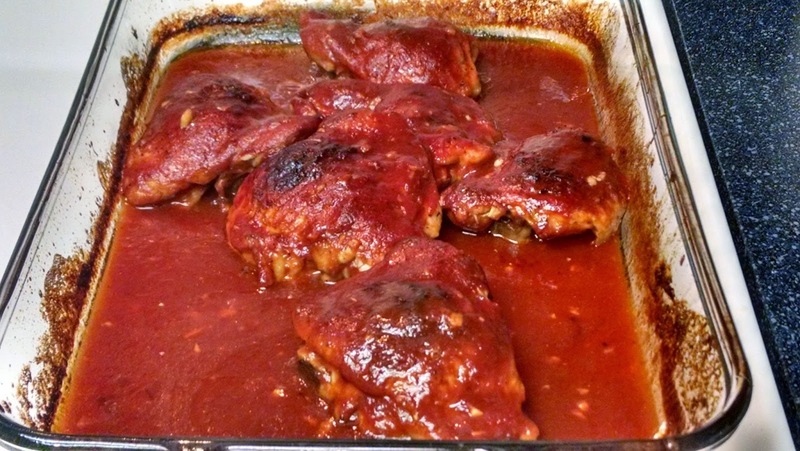 The idea is that you bake the chicken and the sauce together, so as everything cooks together the sauce begins to thicken and adhere to the chicken. It is a really classic, simple barbecue sauce. If you don’t believe me, here is what the dish looks like when finished. I decided to serve it with brussel sprouts (yes you can find that recipe on my blog) and a little rice to help soak up that great sauce. Here you go! Yes, this is baked in the oven, and it tastes as good as it looks. If you cooked chicken as the instructions indicate above you will have overcooked and dry chicken. In my attempt to solve the mystery we used skin-on bone-in chicken thighs because the skin will turn out crispy and it looks beautiful with the sauce. So, now, we must piece together how this recipe would have been comprised when it first came to fruition 30 years ago — and perhaps how to work with it in the 21st century! I have had this recipe numerous times before while I was growing up, but had never seen the recipe on paper. As you can tell, the recipe left me with more questions than answers when it came time to making this myself. I knew the chicken was already deceased and I wasn’t prepared to kill it again. So, in order to avoid the same fate, I knew I would have to pay attention to some clues I had learned along the way. While I will help you solve the mystery, this case isn’t open and shut and I will need to revisit this in order to work out the wrinkles. So, below is my file on how to crack this case. 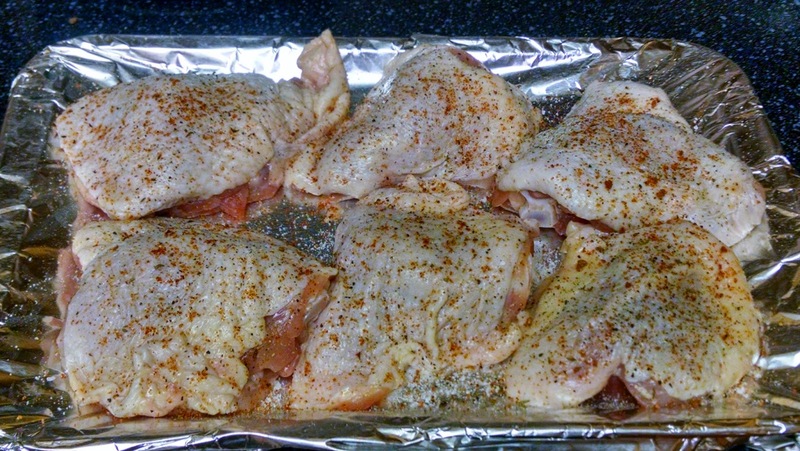 In a baking dish, place 6 chicken thighs skin side up and season with a little olive oil, salt, and pepper. 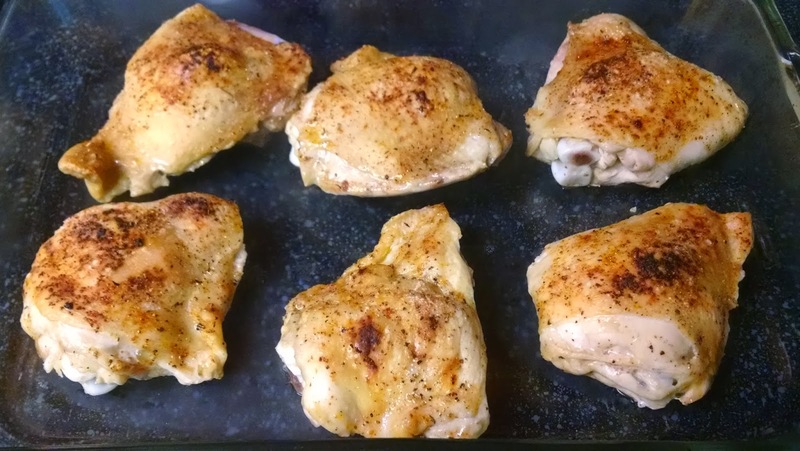 Preheat your oven to 400 degrees and cook the chicken for 20 minutes. After 20 minutes, turn up the broiler for 3 minutes on high until the skin starts to get crispy like the photo below. While you are letting the chicken cook for those 20 minutes, combine the following ingredients in a sauce pot and bring to a simmer. Make sure to stir this occasionally while the sauce comes together. At this point make sure you pour off whatever liquid has rendered from cooking the chicken. I transferred the thighs to a clean dish to make sure I didn’t have any excess liquid when I baked the chicken off with the sauce. Pour the sauce over the chicken, so you have something that looks like this. Next, cook the chicken for 15 minutes at 350 degrees. Then, cook for 20 minutes at 375 degrees. That’s it. You are done, and you will end up with a beautiful play on barbecued chicken. 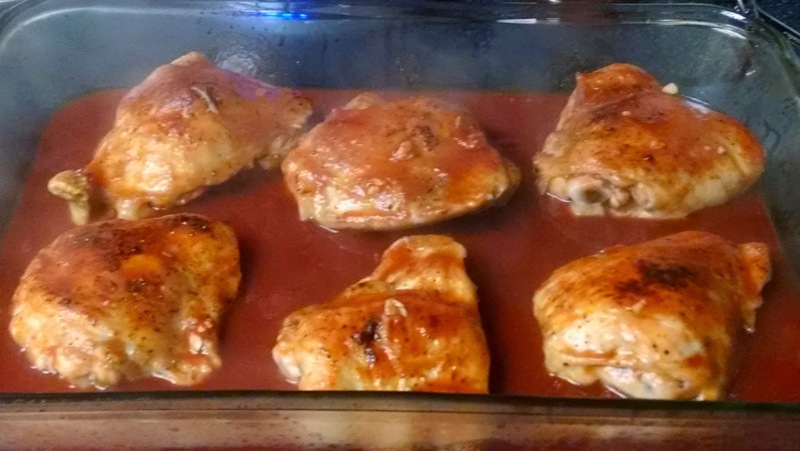 If you take the chicken out and you want the sauce to be a little thicker, just take the chicken out of the baking dish and return the pan to the oven with just the sauce. Check your sauce every 3-5 minutes until it has reached the desired thickness. Not interested in the chicken? No problem, you can do this with boneless country style pork ribs. Again this isn’t tested, so any substitutions are experimental. Remember, pork is cooked through at 140 degrees internal temperature. You just want these tender and cooked through. The cooking time will totally vary depending on your oven temperature and the thickness of the meat. Not interested in meat at all, but want a fantastic, basic barbecue sauce for any application? Seriously, just make the sauce until it has reached the desired thickness and flavor profile that suits you. Put this sauce in a container of your liking and store in the fridge. Want to wake up this sauce a little more? Okay, add a couple of ounces of your favorite whiskey, bourbon, or tequila. This sauce won’t keep you from driving, but will help fortify some of those great flavors. Like wine, taste before you add to the sauce as you will be concentrating those flavors. Also, you could add some ground ginger, ground cinnamon, or cardamom (if you can find it) to make the sauce extra special. Remember, those spices are full flavors so add in small amounts or you will overpower the sauce. So, for now, case closed! Rest assured, together, we will continue to bring this recipe it’s long, overdue justice.